One lucky lottery winner could take home more than $800 million this week, one of the largest jackpots in Mega Millions history. The jackpot has reached a new record high of $868 million, the largest in the game's history, with a cash option of $494 million. The numbers drawn for the Mega Millions on Tuesday were 3-45-49-61-69 and a Mega Ball of 9. No one matched all five numbers and the Mega Ball, pushing the total to the second-highest payout in U.S. lottery history. Only a Powerball payout of $1.59 billion in January 2016 was larger. The combined Mega Millions and Powerball jackpot value is well over $1 billion. The Powerball drawing of $345 million ($199 million cash option) will be drawn Wednesday night. ABC News spoke to several financial advisers about how winners can keep their heads and their winnings. The best thing a winner can do is lay low and remain anonymous for as long as possible, financial adviser and certified public accountant Kurt Panouses, who helped a Florida couple that won a portion of the largest jackpot ever, told ABC News earlier this year. "The initial concern of the ticket is probably the most important part of the planning aspect," Panouses said. "What the individual should do is protect the ticket, keep it safe, put it in a safe place, but do not sign the back of the ticket." "Whoever signs the back of the ticket is the individual that has to claim the ticket and the proceeds," Panouses explained. While Panouses' advice is sound, it doesn't account for long-running traditions among the majority of states which hold state lottery games. In all but six U.S. states, winners are required to come forward and identify themselves at a lottery press conference. The press conferences - complete with the balloons, the media, the giddy winners and the oversized-checks - are vital to the marketing of the lottery games. States gaming officials say that promoting and displaying new winners on television is a regular reminder to other players that you really do have to be 'in it to win it,' as the saying goes. The states which allow lottery winners to remain anonymous are Maryland, Delaware, Kansas, North Dakota, Ohio and South Carolina. 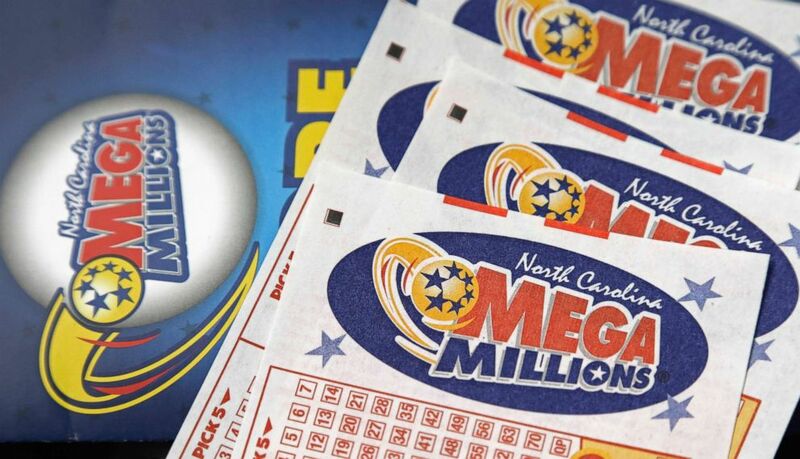 A Mega Millions lottery tickets rest on a counter at a Pilot travel center near Burlington, N.C.
Panouses also suggested making a copy of the ticket and getting a tax professional and an attorney to help manage the funds and offer investment advice. "The tax rate is the highest rate it's been at. In 2018 it's going to be 2.6 percent lower than in 2017. Again, if you're talking about $300 million, that could be seven to eight million dollars of finances that someone could actually have in their pocket by claiming it in 2018," he said of the payout under the new tax law. A group of 20 co-workers from the North American Stamping Group who won a $420.9 million Powerball jackpot in 2016 split the winnings. One of the women from the group has used the money to pay it forward to people in need, including her own family, she told ABC News. "To see my family in better shape, it's a blessing," Amy O'Neal said. If there is a winner, he or she could choose an annuity to receive 30 payments over 29 years or take a lump sum. Experts suggest that players use the full range of numbers available and not limit their chances by playing just numbers such as birthdays because months have no more than 31 days and Powerball numbers go up to 69. The largest Mega Millions jackpot in history was $656 million. Three winners from Kansas, Illinois and Maryland shared that record prize in March 2012.